Whenever you open or save a file in almost any Windows application, you will see roughly the same dialogs for doing so. As of R3 2017 you can keep the UI appearance throughout your application consistent with the new file dialogs provided by the Telerik UI for WPF suite. Apart from support of all predefined themes of the suite, the controls provide most of the functionality of the standard MS dialogs while leaving room for further customization. Easy Navigation: The dialogs allow you to easily browse through your file system either through the tree-view-like navigation pane or the breadcrumb/path pane. A history of the visited folders is kept so that you can seamlessly jump back and forth between folders. 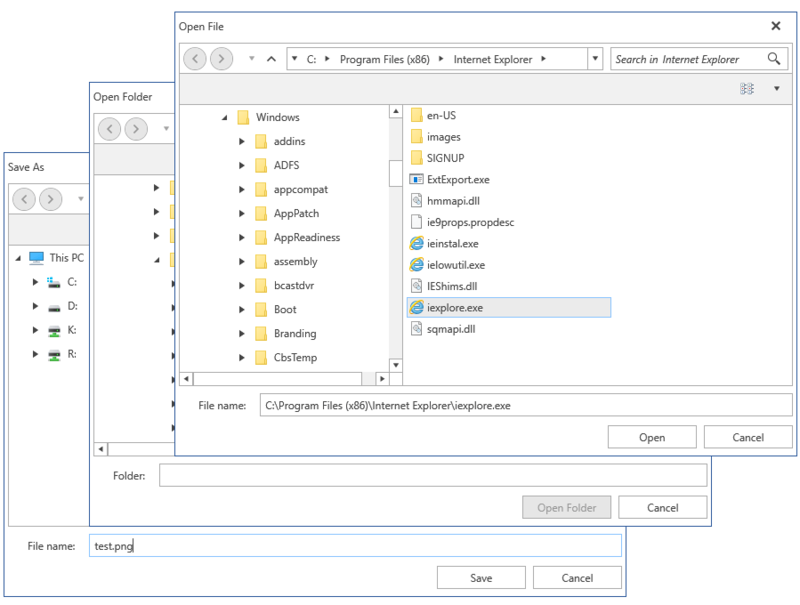 Search: The out-of-the-box search functionality allows you to quickly find just the files and folders you're looking for by using the Windows Search index when available. Customizable Layouts: The controls also provide you with an API to set an InitialDirectory, specify custom folders to be displayed top-most in the navigation pane and switch between different view modes (Tiles, Small Icons, Large Icons, etc.). Variety of Themes: You can persist the appearance throughout your application by applying any of the predefined themes provided by the UI for WPF suite to your dialogs. Keyboard Navigation Support: You can easily navigate through the tree-view-like navigation pane, the breadcrumb/path pane and the files in all layouts by just pressing the arrow keys on your keyboard. Windows File System Synchronization: The dialogs provide seemless synchronization with the Windows File System. Adding, renaming or deleting operations on files are reflected in the dialogs instantly. New Folder Functionality: You can add a new folder in all dialogs with the New Folder button. Context Menu: The dialogs use the well-known Windows context menu. Editing: The controls provide file and folder names editing via the F2 key or mouse click. Touch Support: The dialogs also provide out-of-the-box touch support. Drive/Directory Filtering: You can filter all drives and directories with the DirectoryRequesting event. Codeless Тest Аutomation: You can record, execute and debug functional tests for the controls without leaving the familiar Visual Studio environment. Environment variables: The dialogs support the usage of all system and user-defined enviroment variables. Network Locations: The controls allow you to display network locations by setting the ShowNetworkLocations property. The file dialogs also support many other features of the native Windows file dialogs. Get started with the file dialogs with the Getting Started help article that shows how to use them in basic scenarios.